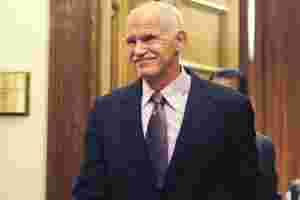 Athens: Greek Prime Minister George Papandreou sealed a deal with the opposition on a crisis coalition to approve an international bailout, but details remain thin despite an EU ultimatum for Athens to get serious about tackling its huge problems. Papandreou, who sealed his fate last week with a disastrous attempt to call a referendum on the bailout, will stand down when the new government takes over, the office of the Greek president said. But otherwise he and conservative leader Antonis Samaras came up with the bare minimum to satisfy Brussels, and they must still agree on Monday who becomes the next prime minister to lead a nation which is destabilizing the entire euro zone. Papandreou’s side trumpeted the agreement, reached late on Sunday at talks led by President Karolos Papoulias. “Today was a historic day for Greece," government spokesman Ilias Mossialos said, adding that the new coalition would be sworn in and hold a confidence vote within a week, if all went to plan. Others were less charitable. “I’m afraid the new government will very soon turn out to be problematic," said Stefanos Manos, a former conservative finance minister. The new coalition has to win parliamentary approval for the bailout before calling early elections. Papandreou’s socialist PASOK party and the New Democracy party of Samaras agreed early on Monday that the most suitable date for the elections would be 19 February next year. Brussels has piled pressure on Athens to approve the bailout, a last financial lifeline for Greece, fearing that its crisis will spill into much bigger euro zone economies such as Italy and Spain -- which would be far harder to rescue. “We have called for a national unity government and remain persuaded that it is the convincing way of restoring confidence and meeting the commitments," he told Reuters. “We need a convincing report on this by Finance Minister Venizelos tomorrow in the Eurogroup." Papandreou had sought the referendum to show that harsh cuts demanded in the bailout had public support, but the risk that a “no" vote could bring about a sudden bankruptcy caused mayhem in markets and unrest in the ruling party. Whoever becomes prime minister will struggle to exert their authority as the party leaders run things behind the scenes, Manos told Reuters. “The civil service won’t implement any decision and everyone will be waiting for the election." Papandreou and Samaras -- who were once US college room mates -- had to bury their deep differences and personal animosity, as Greece is deep in economic, political and social crisis, its future in the euro zone is in question, and their reputations among ordinary Greeks are at rock bottom. “The two leaders had no other choice. If elections were held now, nobody would turn out to vote for them," said Elias Nikolakopoulos, political science professor at Athens University. Many Greeks, who have suffered pay and pension cuts and massive job losses in the past two years, remained distrustful about politicians of all colours. “Elections won’t solve any of our problems now. These parties don’t represent us anymore," said Michalis Skevofylakas, 47, a teacher. Papandreou and Samaras are due to discuss on Monday morning who will be the new prime minister. Greek media tipped Lucas Papademos, a former deputy president of the European Central Bank, as a possible candidate.